Acording to legend, Albam was an officer of the Roman Army in England in the year 305. He sheltered a Christian presbyter, and actually changed clothes with him to aid him to escape persecution. 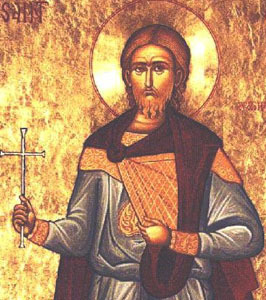 Alban was arrested, tortured and ordered to renounce his faith or forfeit his life. He was executed for his faithfulness by being beheaded at Verulamium, Hertfordshire (now St. Abans). He is the first recorded martyr in England. Legend says the second was his intended executioner who refused to do the deed, and the third the presbyter he saved.